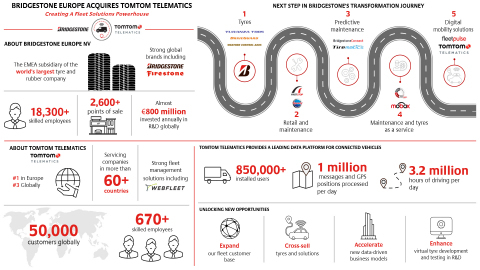 BRUSSELS — (BUSINESS WIRE) — April 1, 2019 — Bridgestone Europe NV/SA (“Bridgestone”), a subsidiary of Bridgestone Corporation in EMEA, the world’s largest tyre and rubber company, today announced it has completed the acquisition of TomTom Telematics (Telematics), the leading provider of digital fleet solutions in Europe, for €910 million. We're the EMEA business of the world’s largest tyre and rubber company. For almost 90 years, we've been providing the confidence to get people and goods where they need to go as conveniently as possible, without interruption. That’s as true today as ever and means we’re trusted where it matters most: where the vehicle meets the road. We’re brilliant chemists, engineers and data scientists with some of Europe’s most advanced factories, world-beating technology, and leading R&D investments. We’re uncompromisingly focused on providing real solutions to the real problems that drivers face on the road every day. We keep them going, no matter what. For more information about Bridgestone in EMEA, please visit www.bridgestone.eu and Bridgestone newsroom. Follow us on Facebook, Instagram, YouTube, Twitter and LinkedIn.